From the beginning of German occupied France, the German Kriegsmarine established a strong base in Brest harbour which would play a strategic role during the Battle of the Atlantic and up until the end of the war. 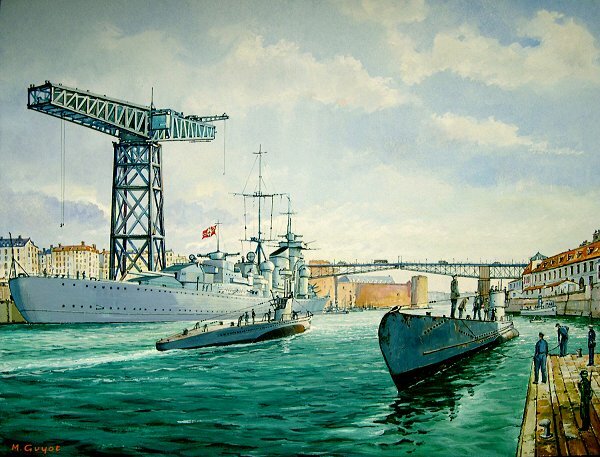 The Kriegmarine's largest cruisers and battleships would seek shelter in this port and in the background of the painting you can see the Prinz Eugen, one of Germany's most important surface vessels. Brittany also housed the Navy's principle U-boat pens (both in Brest and Lorient), which easily withstood all Allied attacks. In the foreground of the painting are 2 Type VII U-boats sailing in the Penfeld. D�s les premiers jours de l'occupation,l'arm�e allemande va s'installer dans le port de Brest qui jouera un r�le strat�gique durant la bataille de l'Atlantique et jusqu'� la fin de la guerre.Il abritera les plus gros b�timents de surface de la Kriegsmarine,cuirass�s et croiseurs, dont le "Prinz Eugen" qui figure en second plan sur le tableau. Mais il sera surtout la principale base de sous-marins (avec celle de Lorient) construite en Bretagne,dont le bunker r�sistera � tous les bombardements alli�s.Au premier plan,on peut voir deux sous-marins de Type VII � flot dans la Penfeld.